The Lady Garden Campaign is back and continuing last years work, to change the future of female gynaecological cancers, by empowering women everywhere to talk more openly – without shyness or shame. The campaign supports research to improve treatment for Gynaecological Cancer, led by Dr Susana Banerjee at The Royal Marsden hospital. 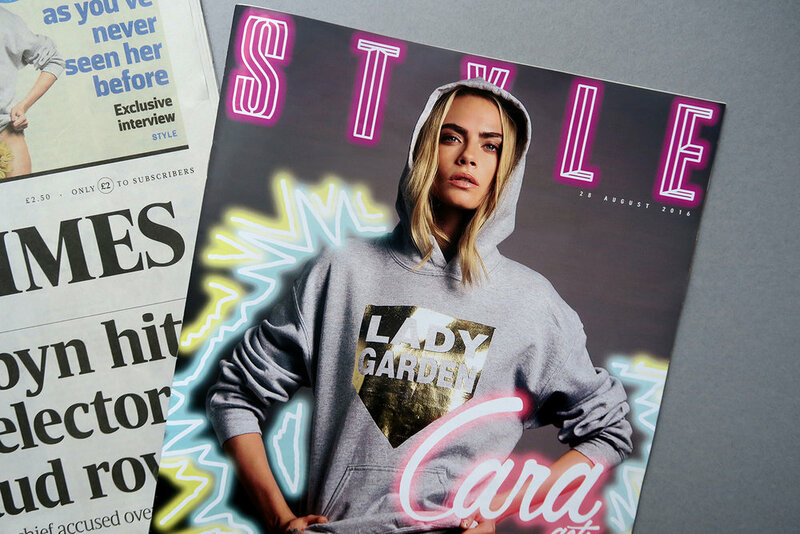 Cara Delevingne launched the 2016 campaign with a front cover and exclusive interview for the Sunday Times STYLE magazine. The new statement hoodie and sweatpants are on sale at TOPSHOP from the 8th September, 30% of each sale will go straight to the Gynaecological Cancer Fund. The Usual Studio worked alongside founder Mika Simmons to build on last years work, freshening up the website design, with a new metallic colour scheme, new text tiles and graphics by Black Score. Web development by the team 18a Productions.